Cows do best with a consistent routine that allows them enough time to eat, rest, and make milk. When I was in middle school, the barn on my family’s dairy farm burnt down. Most of the cows escaped, but the entire wooden part of the structure was gone, leaving just the brick walls standing. We used those brick walls as the foundation for the new tie stall barn we built. During clean up and construction, we housed and milked our cows at a farm that had recently sold out about 25 minutes away. It was a June day when construction of the new barn was complete and the herd could return home. Fittingly, the first cow to walk into the barn was one of the boss cows, a leader, who had always been one of the first cows to return to the barn after being released to pasture. Even though the cows were being unloaded through a different door (not the one they would have normally come through), that cow marched right down the alley and hopped into the stall that always had been hers, third from the front door. That cow’s actions have always stuck with me. I think it showcases how good a cow’s memory is — and it proves that cattle are certainly creatures of habit. Researchers have observed cows in barns to estimate how much time they do certain activities each day. Obviously, dairy cows need to eat, drink, and be milked. They also need time to socialize, and most importantly, they need time to rest and make milk. The University of Wisconsin (UW) School of Veterinary Medicine recommends a minimum of 12 hours of lying time per day for a lactating dairy cow. That leaves half a day to accomplish all the other tasks. The UW team estimates that cows spend about 4.5 hours per day eating and 2.5 hours per day in the alley of the freestall barn (this includes drinking time). Another two hours are spent standing in the stalls, which leaves just three hours per day for milking. Any additional time over three hours spent away from the pen typically means a reduction in lying time. 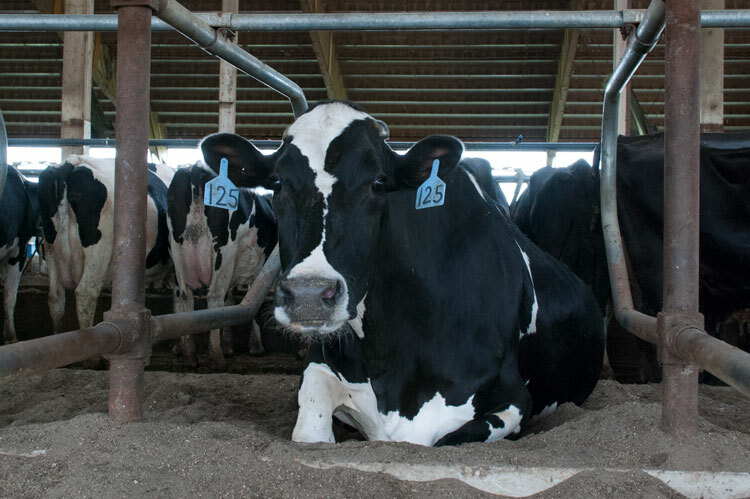 While time budgets for cows in tie stall barns would look different, access to fresh feed, clean water, and a comfortable lying surface are all just as crucial to be sure a cow can fill its day productively. Certain parts of a cow’s day are scheduled by humans, such as milking time and when feed is available. However, the more free time we can provide cows to eat, drink, and rest will hopefully keep them healthier and making more of the milk we depend on.